It's in the rain...and just one drop will kill you. They don't believe it at first. Crowded in Zach's kitchen, Ruby and the rest of the partygoers laugh at Zach's parents' frenzied push to get them all inside as it starts to drizzle. But then the radio comes on with the warning, "It's in the rain! It's fatal, it's contagious, and there's no cure." Two weeks later, Ruby is alone. Anyone who's been touched by rain or washed their hands with tap water is dead. The only drinkable water is quickly running out. Ruby's only chance for survival is a treacherous hike across the country to find her father–if he's even still alive. Another book I’m reading a lot later than when I received it! I really looked forward to reading The Rain, and so when I got the chance to review it I jumped for joy, because this book sounded like all kinds of awesome. However, university got in the way and I only picked it up now. Andddd... I’m kind of torn when it comes to this book. On one hand I absolutely love the idea for this book. Killer rain! I’ve never read anything like it across the YA spectrum. I’m all for gritty survival stories too–and so an apocalyptic book like The Rain was totally on my list of books I need to read. But, but, but: there’s the main character. Oh the gods, how I absolutely LOATHED her (I’ll get more into it in a bit!). I came out of this book with pretty mixed feelings and so I apologise ahead of time if I do end up ranting in this review but sometimes I just can’t help it. The Rain starts off pretty dramatically: Ruby’s at a party at her friend’s house, making out with this boy and then is suddenly pulled out of the hot tub by Zak's parents just as it starts to rain. The teens just kinda laugh off how his parents are acting... all until Casper, the boy Ruby was making out with, starts bleeding and dies. I felt pretty bad for Ruby at this point. At this point in the book they unveil what exactly is going on with the rest of the country, what’s going with Ruby’s family, and basically how the rain is killing people and creating a ton of problems. Pretty good stuff. The plot actually had so much potential but it was totally ruined by a whiny protagonist. Where was I? Oh yes: Ruby. I really wanted to feel bad for her character. Honestly I did. At parts, I actually did, like when her mom and baby brother die, when Simon dies–basically, when everyone around her dies. I also liked that she was good to the animals. It was just the constant blabber of unnecessary thoughts that majorly pissed me off. First of all, her biggest concern? That she left her cell phone at Zak’s house. I mean, what are you going to do with your cell phone Ruby? The lines are down, there is absolutely no use for it. AT ALL. Secondly, she absolutely AWFUL to Darius, who is a super sweet and thoughtful guy, and actually says–and I’m not exaggerating–something along the lines of “he should be thankful that a girl like me would even look twice at him” or something like that. I mean ?!?! Wow. Thirdly (and yes, I’m not done), she actually breaks away from the actual plot and spends a while stealing cosmetics and clothing that are totally impractical for the situation. Okay, on one hand I get the whole looting thing, but seriously: heels. Fake rub-in tan. Hair dye? Priorities, girl, PRIORITIES. At this point I got kind of mad at the plot because instead of going to find her father she spends time doing this other sh*t instead. Even though I have my beef with Ruby, there’s no denying I will be picking up the sequel. I’m just super curious to see how this will all end. Will there be a cure? Will the rain ever stop? What’s going to happen to Ruby (not that I really care much) or (more importantly) Darius and Princess? 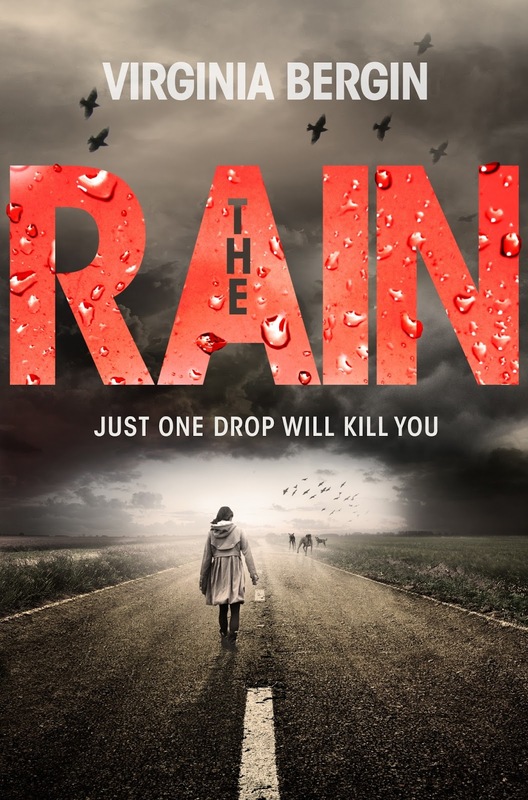 The Rain builds up a suspenseful and tense atmosphere, and readers will constantly be caught up in what has become of Earth and the people who have survived thus far. Virginia Bergin has created a frightening apocalyptic story, which had me flipping pages from start to finish. Regardless of my views on the main character, I definitely believe (I am hopeful!) that this story is about to get SO much better. I'm very, very intrigued by the premise... a rain that kills is something I don't think I've read before. Is it caused by environmental factors? Will there be something that will protect people from it? I'm getting excited already :) Very sad that there is a whiny protagonist, though... I mean, come on, people are dying around you, and you may be next, and you'd rather waste time on... cosmetics and heels? Hopefully the other factors would help me forget about her annoyingness.